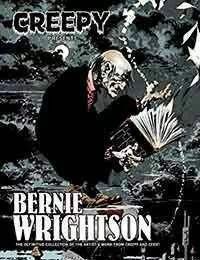 Horror legend Bernie Wrightsons Creepy and Eerie short stories, color illustrations, and frontispieces are finally collected in one deluxe collection! These classic tales from the 1970s and early 1980s include collaborations with fellow superstars and Warren Publishing alumni Bruce Jones, Carmine Infantino, Howard Chaykin, and others, as well as several adaptations and original stories written and drawn by Wrightson during one of the most fruitful periods of his career! The infamous Jenifer is included, as well as Wrightsons fullcolor Muck Monster and adaptations of Poe and Lovecraft classics.